Newport Gwent Dragons have signed two new forwards - Cornish Pirates lock Ian Nimmo and prop Tim Ryan from Italian club Cavalieri Prato. Nimmo, 26 and 6ft 7in helps plug the gap created by Luke Charteris' move to Perpignan. Ryan's career began at Munster before stints at Toulon, Newcastle and Cavalieri Prato. "We have been impressed with how they have performed this season," said Dragons boss Robert Beale. "And hopefully they will continue in that same vein here at Rodney Parade." Nimmo and Ryan, 27, take the Dragons' summer signings to four with wing Tom Prydie having signed from the Ospreys and back-three player Dan Evans coming in from the Scarlets. The forward duo have signed two-year deals for the Pro12 Welsh team. 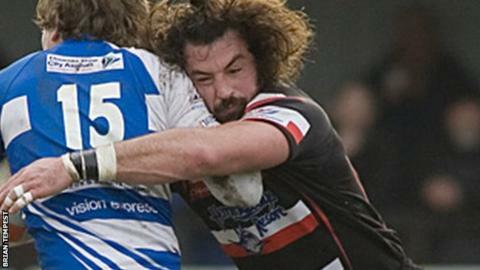 Nimmo helped the Pirates reach the English Championship play-off final, in which they lost out to London Welsh over two legs. Nimmo earlier this month, but the club allowed him to leave the Mennaye after the Dragons came in for him. Ryan switched from back to front-row during an early career that included being capped by Ireland Under-19. He left Munster for Toulon ahead of the 2009-10 season. Nimmo is a former Scotland Under-21 international who has played for Leicester. Beale added: "I'm looking forward to working with both Tim and Ian. "They bring with them a wealth of experience from playing across Europe and this will only help strengthen our pack going into next season."